Phillip and Gideon Breker peel a very interesting looking scotch pine. UPDATE: Congratulations to Regina Jochim and Aaron Cavanaugh, the winners of the mystery log contest! 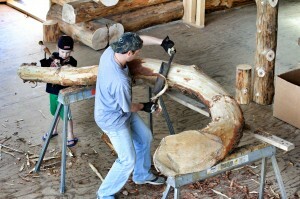 Regina and Aaron each guessed the log will be used as the bar rail. That is absolutely correct! We will have a small beverage serving area on the second floor balcony and we will use this beautiful log to rim the front edge. Aaron said, “Belly up to the bar, me boys!” Great line! Imagine bellying up to this beauty. An odd shaped log has appeared on the construction site at Coteau des Prairie Lodge. We harvested this interesting scotch pine from a large evergreen planting in the pasture where the lodge is located. As you can see, the log has all kinds of great character! We know what we are going to do with this spectacular log. But you don’t. So why not take a guess? 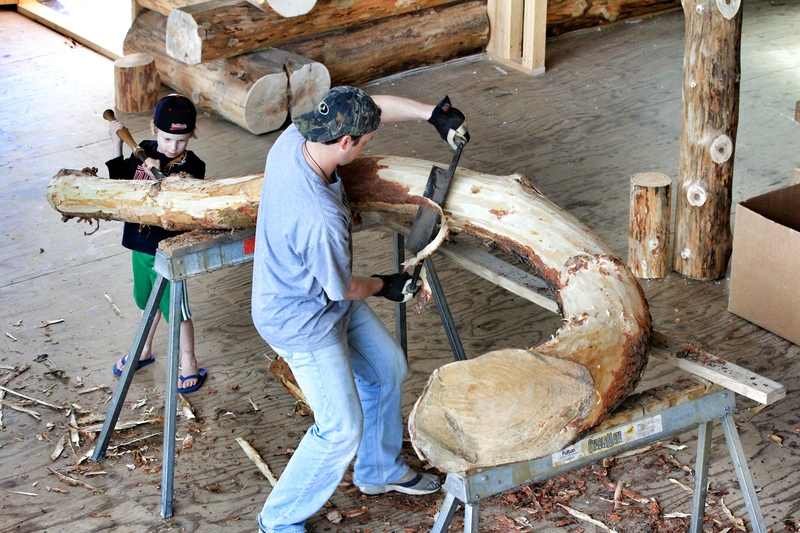 How do you envision this log being used at Coteau des Prairies Lodge?? Heck, you might even come up with a better idea than ours! As a prize, the person who has the closest or correct guess will win one of our fashionable brown waxed canvas logo caps! If you win, your wardrobe will thank you. Don’t dilly dally, this contest will end Thursday, May 10th! Leave a comment below to make your guess and enter the contest. Hey,if it was me, I would use that interesting log for an archway! That would look really cool. Your place is looking great! Absolutely looking awesome guys… A place the family should be proud of. Would love to see it in person some day. I would use it within reach of the public, whether it’s on the wall or as a custom-built coffee table. etc. The patina created by thousands of hands over the years is beautiful. And my great grandchildren will be able to visit the Lodge one day and realize that I had actually touched it also and added to its luster! Richards guess is a Wildflower garden boarder ornament. I think you should use it for the entrance or gateway to your lodge. I would guess this log will be used for a light. Well, I’m thinking that it could either be used as a cool bench, or else mount it on a wall and display it as one of the lost long horns from Babe the Blue Ox. You might have to paint it blue, though…or shine a blue light on it. You will hang it over the front doorway with your name burn-etched into it. It leaves a lasting impression for all who enter. I’m saying, “Belly up to the bar, me boys!” would be the main function. Nice serving bar for snacks and whatnot. I would use it as part of the front desk. That way everyone would see it when they enter.